Earlier this year, I wrote briefly about visiting the "Gothic" exhibition at the British Library and ended that piece with a sketch. Its time to pick up the threads of that post and finish the story. 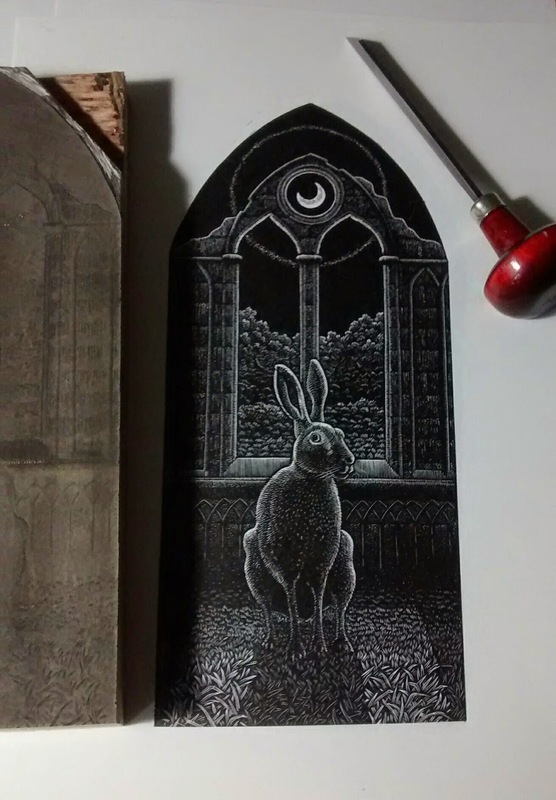 I make an engraving last year called Moonlit Ambling using an artificial Resingrave block and decided to do the same with this print. My work on boxwood has become even finer, especially with bookplates and so this is something of an antidote to that, forcing me to work a little more boldly. I decided from the start that I would shape the block. I needed to cut the surface away quite drastically to prevent picking up ink from the edges so I reached for a saw and chisel and did the job thoroughly! After a few days working on the engraving, it was time to pull the first proof, always an exciting time. No matter how well one thinks things are going, you never really know until you see a proof. As it happened, I was very pleased with the result but with one reservation. There seemed just a little too much foreground. I used paper to mask off the lower edge and this confirmed my thought. More drastic action; another saw! Here is the finished engraving. I like the almost cheeky expression. The eye was designed to put one in mind of the moon. 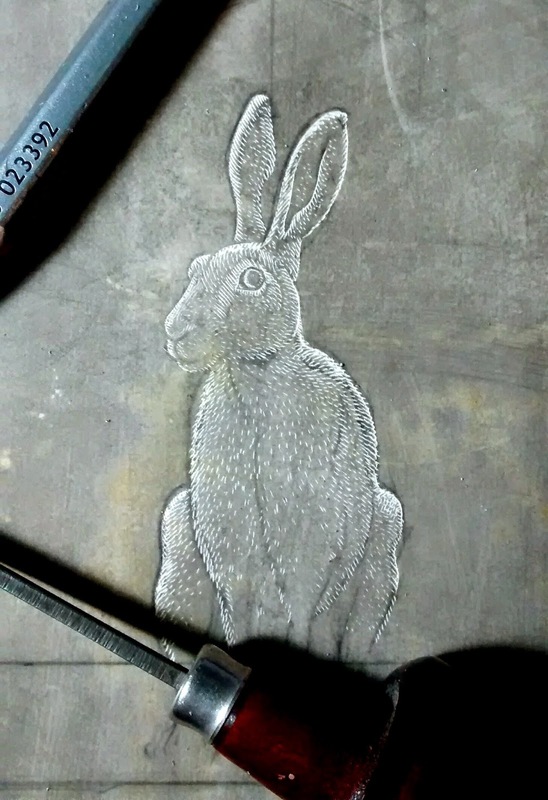 You will be able to see this engraving at the first Hepworth Wakefield Print Fair. I will have a large selection of my engravings, hhand printed books and, as usual, I will be engraving at my table so you can see how it all happens. It would be great to see you in Yorkshire on 21st/22nd March. Admission is free. If you did want to buy from me, I should point out that I can't take credit cards so bring your chequebook or cash. 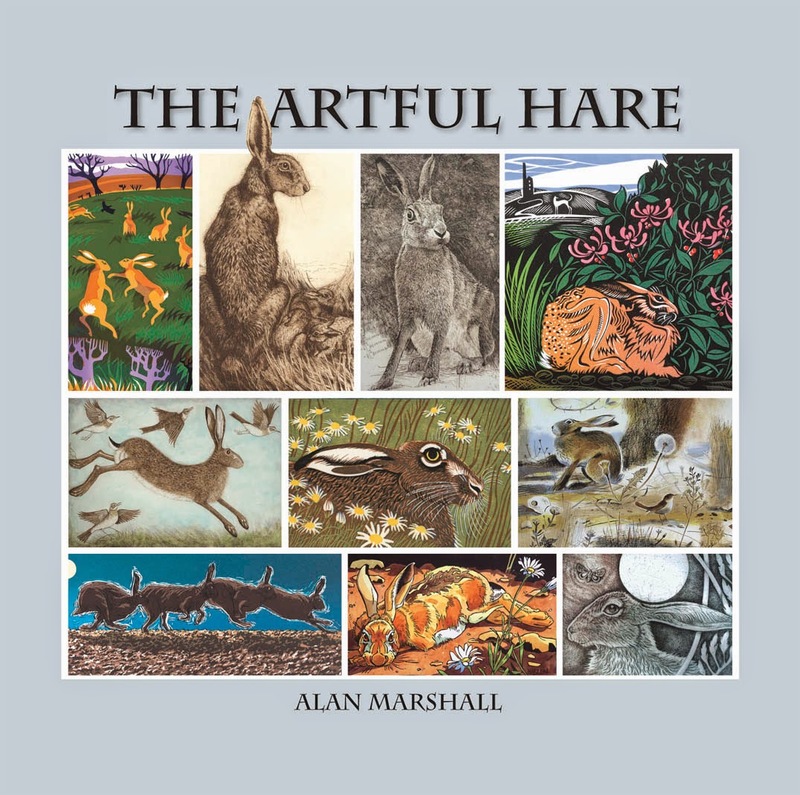 "A Gothic Hare" also features in an exciting book called "The Artful Hare" which will be available later Spring/early Summer. 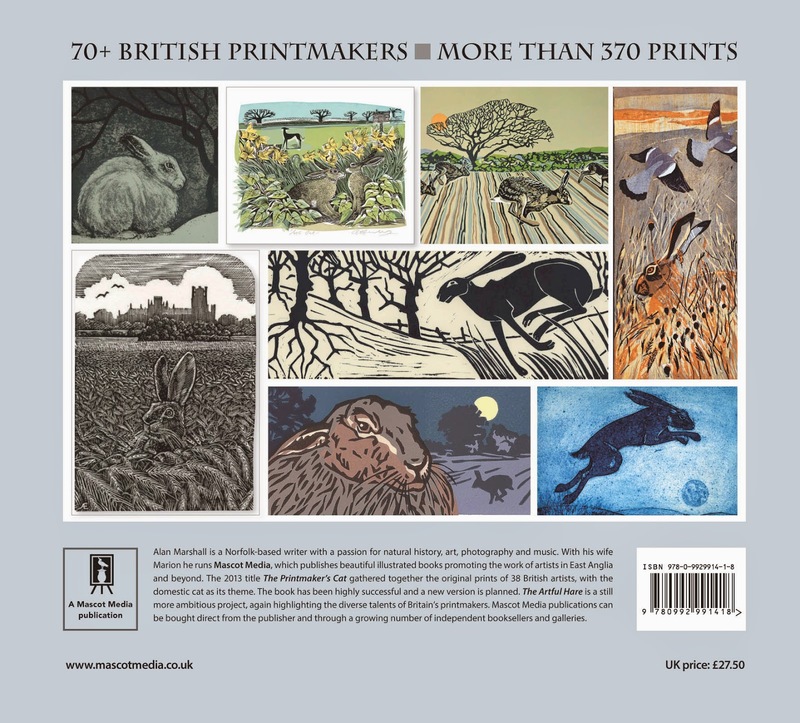 I have several more engravings included - and yu can see one of my hares peeping at you from the back cover. More news about this book when it is available. We certainly weren't disappointed. This was the largest exhibition dedicated to William Blake that I had attended since the one at the Tate I had visited back in 1978. In some ways this was more interesting for me because of how the exhibition was arranged to include the three periods of apprenticeship, development and mastery of his printed books and then the influence the old Blake had on younger followers. Blake was always my hero - coming from a family of Blakes helped develop my interest as a child. Having been a young collector myself, scratching around in junk shops and bookshops with my pocket money, I was delighted to hear about the ten year old Blake attending auctions and buying Old Master Prints. I had seen very little of Blake's early work, making this exhibition a real treat. I am more familiar to his hand printed and coloured books but it is still a special occasion to see so many on display. "Something of the excitement of gambling, without its guilt and ruin"
I am very lucky to have found two impressions of my favourite engraving pulled from Blake's original engraved woodblock. The first is lightly inked on a wove paper and the second more fully inked on a smoother paper. Both delight me, as you can imagine. This engraving still influences me in my work. Another delight; we have a new Grandson, Blake English.